Part of the reason we started WeighMyRack was so we wouldn’t get suckered into buying crappy gear just because it was on sale. Buying the right gear saves time, money and energy. This page is to help climbers find great gear at a discounted price. At the same time, one can avoid future frustration by resisting the temptation to buy less-than-ideal gear simply because it’s on sale. 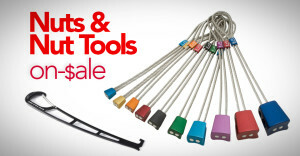 Not sure if these sale ropes are right for you? Compare every rope on the market (including these sale pieces) at weighmyrack.com/rope. Above you’ll find a list of all the dynamic rock climbing ropes (and a few statics, if you want a rope to haul on) that are on sale right now at online retailers. This page automatically updates multiple times each day to show you every deal there is. From Beal to Tendon, if it’s on sale, online, we’ll list it here.